It's important to notice the distinction between “a beast” with seven heads (man's cruel warmongering reign of power), verses “the BEAST” (Antichrist) which comes forth from the 7th king. The beast with seven heads with teeth are representative of the brutality of world conquerors throughout history. War has claimed 200,000,000 innocent lives over just the past two centuries. 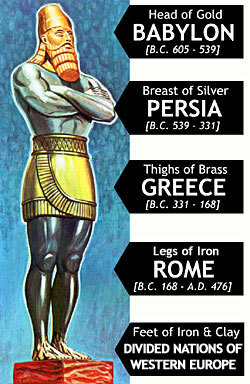 There have been 6 world powers throughout history; namely, Egypt, Assyria, Babylon, Medo-Persia, Greece, and Rome. There are no world powers today, only super powers like China, Russia and the United States. I love Jewish people. I have to say this continually, because the first and foremost defense by Jews is to attack their critics with accusations of anti-Semitism. I love Jewish people, just as I am commanded by God as a Christian to love all mankind. It is NOT true Jews who are to blame for the evils in the world today; but rather, false Jews of the synagogue of Satan, which the Bible warns about in Revelation 2:9. 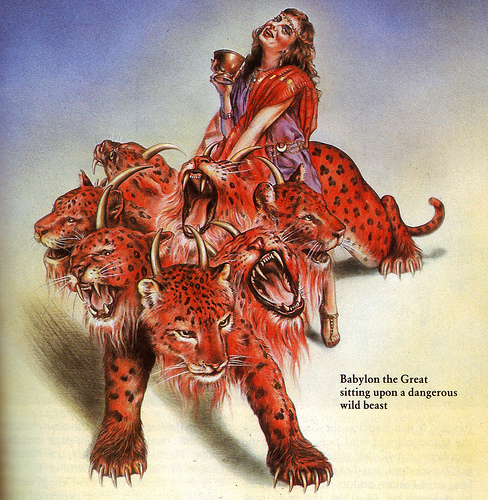 Notice that the woman controls the beast, that is, secret societies control the New World Order and its mechanisms. What Hitler's Nazi war machine couldn't achieve through force, Communism has accomplished through stealth, incrementally. 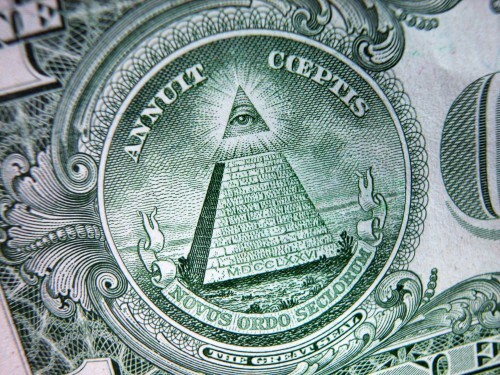 One of the most powerful weapons of the architects of the NWO are financial weapons. The World Bank, United Nations, Bilderberg, IMF, CFR and other power elite groups are forcing the world's nations into bankruptcy (and thus a no win situation where they either become slaves to the NWO or crumble). This is how the global elite are building their criminal empire. They're already conquered Iraq, Libya and Afghanistan. Egypt is on their side. Syria is next, then Iran. They're hi-jacking the Middle East. Albert Pike (1809-1882) predicted with uncanny accuracy World Wars I, II and even III. “The high office of the President has been used to foment a plot to destroy the American's freedom and before I leave office, I must inform the citizens of this plight.” — President John Fitzgerald Kennedy - In a speech made to Columbia University on Nov. 12, 1963, ten days before his assassination! President Kennedy was killed in broad daylight to let future U.S. presidents know that no one who goes against the criminal elite powers that be are safe. 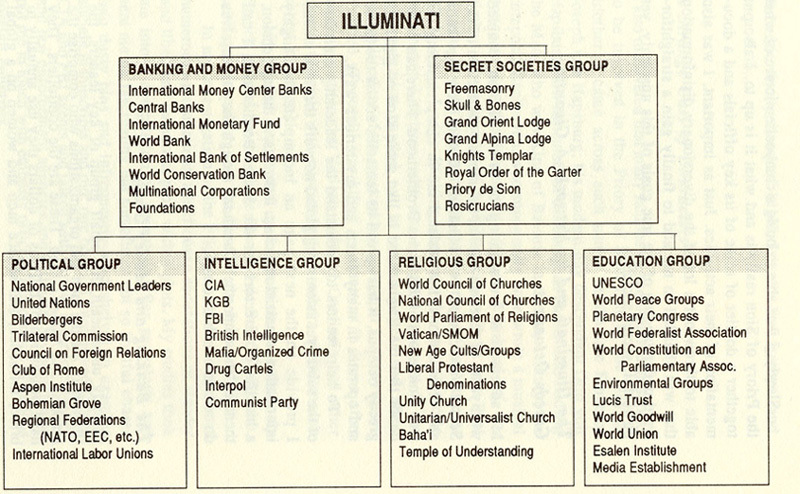 They've (namely, the banking cartel) hi-jacked our federal government. If you watch the video of Kennedy being shot, you can see his body guards backing off as the car turns, to get out of the line of fire of the shooter. Then the alleged shooter is shot dead (what a perfect cover). It's like Seal Team 6 that allegedly caught Bin Laden, and then months later their helicopter blows up and they all die. Right! More cover-ups? Bin Laden's body dumped at sea? You could in fact make this stuff up (and they did), but it's not very plausible. What a joke!